A powerful rally to support Ireland’s nurses to take place on Saturday | SHEmazing! The healthcare crisis is escalating as the nurses and midwives remain on strike for another day this week. The impact on tens of thousands of patients is causing chaos, as members of the public are asked not to use out of hours GP services as hundreds of doctors gather for a protest in Dublin. News has since emerged that a rally will take place this Saturday, allowing members of the public to support the nurses and Irish Nurses and Midwives Organisation (INMO). 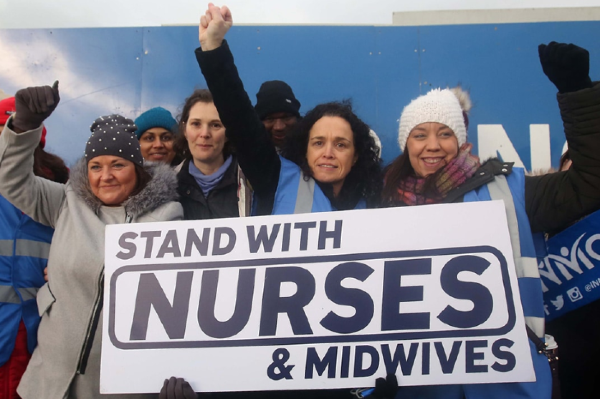 Over 35,000 nurses and midwives voted overwhelmingly in favour of industrial action late last year, with their first 24-hour stoppage taking place on January 30 and second strike occurring yesterday. The Facebook post reads; "Join the nurses' protest, called by the INMO, this Sat 12.30pm Parnell Square Dublin. Leo Varadkar and the Fine Gael led government are refusing to negotiate with the nurses." It continues, "They are ignoring the huge public support for their legitimate claims. Most of us know that nurses deserve equality of treatment with other professional grades, better pay will help ease the recruitment crisis and that means better patient care in our hospitals." "Nurses do not want to strike – they would prefer to care for their patients. We can help by turning our sympathy into a major display of solidarity." it concludes, calling on the public to text their numbers to join the rally at the Garden of Remembrance. Further strike action is expected to take place on February 7, 12, 13, 14, 19, and 21, which is sure to affect a huge amount of patients. Patients are being asked by the National Association of GP Co-ops to travel to emergency departments, or to wait to see their own GP if any ailment is experienced. Other disruptions include the cancellation of outpatient appointments, non-urgent surgery, and respite, rehabilitation, and day centre services. An estimated 50,000 patients in the past week were affected. There were 410 patients waiting for hospital beds this morning, with highest figures in UH #Limerick (50 people), #Cork UH (29 people), and UH #Galway (27 people). Another strike is expected tomorrow, with up to 75,000 people likely to be affected. As of last night, there appears to be little hope of resolving the pay dispute, with the INMO accusing the Government of “recycling” ideas and calling on them to “come to the table unconditionally”. Taoiseach Leo Varadkar admitted that direct contact should have been made with nursing unions regarding further talks at the Workplace Relations Commission to resolve their dispute, instead of through a press release. Leo Varadkar said offering a pay rise may not help retain nurses or attract young workers to the profession. He responded to critique from Fianna Fáil leader Micheál Martin, who claimed the statement was an "appalling and a pathetic way" to approach the dispute. Yesterday, the Fine Gael Government issued a statement saying it was willing to engage in talks on issues other than pay to try to overcome the nurses' strike. General Secretary of the Irish Nurses and Midwives Organisation Phil Ni Sheaghdha said the Government had not communicated directly with the unions. We've just set the route for the #StandWithNursesAndMidwives march on Saturday 9th Feb at 12:30pm. Adult mental health services are also coming under huge strain today and tomorrow due to a ban on overtime, including night rosters, as members of the Psychiatric Nurses Association (PNA) engage in industrial action. Doctors will join the disagreement by heading to the Dáil to protest at conditions and pay cuts, which was organised by the National Association of General Practitioners. Other aspects of the healthcare crisis involve a lack of beds, and the disastrous cost of the new National Paediatric Hospital, which sum now stands at €1.7 billion.